Hillsboro, Oregon (February 12, 2019) – Phoseon Technology, the leader for Innovative LED Solutions™, completed a successful 2018 during which it launched a number of key products and technologies while delivering its 100,000th UV LED curing lamp. 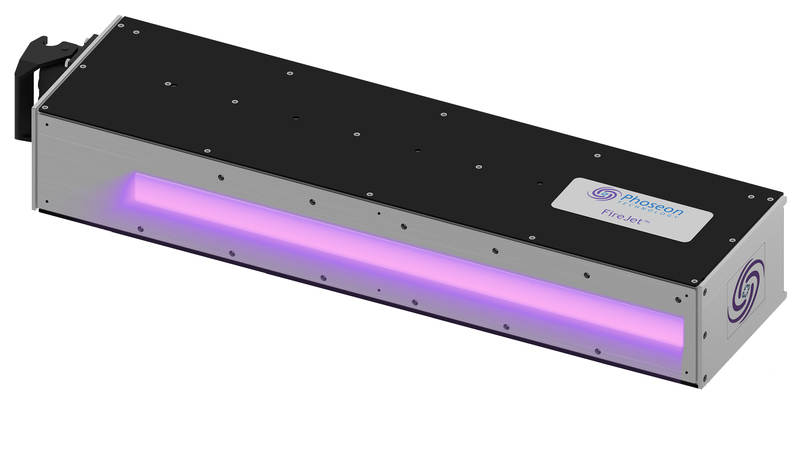 The FJ605, a self-contained air-cooled UV LED curing lamp, for flexographic applications delivering substantially more curing energy than currently offered. The FJ605 was showcased at Label Expo 2018 in a flexographic press operating at 1,000 feet per minute. The water-cooled FL440 was designed for the most performance demanding print and industrial curing applications, offering scalability to support custom length options. It delivers the most UV output available in the market with up to 135W per 25mm Semiconductor Light Matrix (SLM™) array. Last year also saw the introduction of the revolutionary KeyPro™ KP100 microplate decontamination system, a standalone decontamination unit that saves time and money compared to existing chemical and heat methods. The KP100 for Life Sciences researchers and lab managers is targeted for use with compatible microplate and preparatory slides commonly found in laboratory environments providing increased repeatability through the use of stored protocols for different equipment categories. To date, Phoseon has delivered more than 100,000 units into a wide variety of applications including OLED display manufacturing, wood and fiber coatings, adhesive bonding, and high-speed analog and digital printing. In addition, Phoseon shipped its 25 millionth patented Semiconductor Light Matrix™ (SLM).